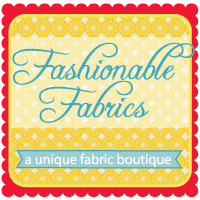 Fashionable Fabrics is offering a $25 gift certificate to one of my blog readers! Fashionable Fabrics has the latest in fashion fabric from your favorite designers. They feature fashion forward novelty fabric for seamstresses and crafters looking for prints and patterns that are often unavailable in traditional outlets. They specialize in premium fashion forward Designer Fabric, Novelty Fabric, Home Dec Fabric, and Sewing Patterns. We carry the latest top Fabric Designers and Fabric Manufacturers such as Amy Butler, Anna Griffin, Anna Maria Horner, Heather Bailey, Jennifer Paganelli, Monaluna, Patricia Bravo, Patty Young, Sandi Henderson, Valori Wells, Alexander Henry Fabrics, Art Gallery, David Textiles, Free Spirit, Kokka, Michael Miller, Moda, Robert Kaufman, Studio e Fabrics, and Windham just to name a few. You are sure to find lots on your list at Fashionable Fabrics...and you have 2 ways to enter the giveaway for the $25 gift certificate. For one chance, just leave a comment on this post. For a second chance, visit Fashionable Fabrics, have a look around, then come back and leave a comment mentioning your favorite collection or print. The giveaway will remain open until Monday, February 20th! Thanks so much for stopping by...and good luck! Thanks for the intro to the new store. It looks lovely. Love to browse sites and a really nice place that I did enjoy...Thanks! I saw Half Moon-love it! Wonderful store with lovely fabrics..and I like the Daisy Cottage Furniture fabrics. Thanks for the giveaway. Who wouldn't want to win? They definitely carry gorgeous fabrics. I like the Children at Play line as well as the scissors print by Cosmo Cricket. Wow! Great giveaway! Thank you so much for the opportunity! My goodness! What's not to love?! But the flannel Love Bird collection jumped right off the page at me! Thanks, again! My favourite is Delighted. Thank you! Oh Your block you had on the other post looks great! thanks for the chance! Fly a kite by Riley Blake is soo cute! I wish I had your ambition to get my sewing room organized AGAIN.. Seems it never stays that way long.. Thanks for a chance at your give-away. Wow, thanks for the awesome opportunity!! I am a (happy!) follower! How Tweet It is Bird with Swirls by Timeless Treasures, that would be something I LOVE!! I love the oval elements by art gallery...great basic. I just received "A Walk in the Woods" but I love "Folklorico"-- very original! LOVE their shop, THANKS for the chance! What a great giveaway! This shop has a great selection, and I love the fact that it is easy to find what you need! I love to organize, too! ooh...hard to choose but I really heart 'A walk in the Woods' it is so pretty. I went to their shop and looked (fun!) at their fabrics. I found out that if you click on "fabric by print" you can find all of the paisleys, or all of the dots, etc. in their store. I love dots, and I was blown away to discover that they have no less than 99! Thanks so much for the give away....and can't wait to see the reorganized space! That always feels so good. My fabric choice....the "hoot owl" fabrics...they are sooooo cute! My favorite is Lizzy House's "Outfoxed" collection. Your block is wonderful; thank you for this delightful giveaway! Hoot Owls and Flowers on cream by David Textiles is a favorite. I really like the Timeless Treasures lines! thank you! headed over to ck out the fabrics now! I love looking at new goodies! I like them all but I really like the Sugar Rush collection! Having an opportunity to win a gift certificate for fabric is always an awesome thing! Thanks! There are so many wonderful fabrics at Fashionable Fabrics. I looked through the entire novelty fabric section. I saw a bunch of boy/male robot/rocket type fabrics that I would like to buy. There was one fabric, too, with the little drag race cars that I really liked! Thanks for the great giveaway. It's always nice to find new 'shops' to visit! I love Aneela Hoey's new line, A Walk in the Woods, or the Children at Play line. Loving that!! I've had my eye on Flurry by Kate Spain for a long, long time. Thanks for the opportunity. Fashionable Fabrics certainly does have a lot to choose from. Always glad to have an excuse to check out a new fabric store! Thanks for the chance to win. I follow you via blogger. Great store, will have to keep it on my list! I like Elephants on Parade by Timeless Treasures. Thanks for the chance! I love Half Moon Modern. Thanks for a chance and the introduction. I liked way too many things once I found the novelty section. Owls, hearts and so many other cute things. Thanks for a chance to win! Your post about organizing your sewing space made me think I REALLY need to organize mine. I'd rather sew, so it probably won't be happening anytime soon. I "window shop" at Fashionable Fabrics often. I think my favorite thing changes every time. Today I really love Lush by Patty Young. Very nice! Thank you! I would be thrilled to win! Thanks for the chance to win. I enjoy your blog. Have a great day. Lil' Miss Sew and Sew is super cute, but I LOVE those Hoot Owl Owls and my sons both love the Superman! Thanks again for the chance! Wow, I get to check out a new website! Thanks for the chance to win. I saw so many things that I wanted when I visited Fashionable Fabrics. I really like the Reunion fabric collection. Wonderful - an online quilt store I was unfamiliar with. I'm off to check Fashionable Fabrics out. I have never shopped here before but I'll have to check it out--shipping is totally reasonable! Fashion Fabrics is awesome!! Thanks for introducing them to me! I am loving Lush at the moment!! I am a new follower!! Thanks for this great giveaway!! I am a follower...thanks for the chance at a wonderful giveaway at a new to me store. I like the Oval Elements line...great addition to any fabric stash. i love alexander henry farmdale in red blossoms...oooooh, i neeeed that fabric! And I love anything Amy Butler. Love all of her fabrics! What a nice giveaway. Thanks for the chance to win! I like Reunion Babys Bunting in Dark Blue by Moda. Like the white version as well. Thanks again for the chance to win. I love Kate Spain ...any at all by her. Hooray a giveaway and a link to a new to me fabric store! Hard to choose just one favorite, but I did like Elephants on Parade an awful lot! the teal colorway of fly a kite by riley blake is phenomenal!! I follow your blog, and love your work. i heart your blog . . . thanks for taking time to inspire us!! If I won, I would have to choose some of those Hello Kitty fabrics for my little granddaughter. Thanks for a chance. Can't beat gift certificate giveaways - thanks! Heading over to have a look around the shop - I'll be back! OH, now I remember the shop! I've been drooling over "a walk in the woods" for awhile! I'm loving Lush. And I like the flat-rate shipping as well. Good to keep in mind! Fun block in your project. I really enjoy the inspiration!! Fun fabrics by Riley Blake. Maybe my new fav !! Referring back to your post about cleaning. I'm surprised you got any sewing done at all. I did that several weeks ago. At the time I was trying to get organized for a quilting retreat. I was only taking 2 classes but needed to decide on fabric colors and I had homework. As I looked over my scraps, (one was a scrappy quilt), I decided to get them better organized and ended up emptying drawers and sorting photos and genealogy, all the time thinking, "I don't have time for this right now." I like what I see when I open my cupboards now, I survived the retreat and finished the scrap quilt top. So I guess I had the time afterall. Thanks for the giveaway. I like the Venice Masks. Thanks. I hope you didn't lose anything while organizing like I usually do! I like to tell my husband that's why my sewing room is so messy. Thanks for the chance to win some fabric $! I would love a chance for the giveaway! Thanks for offering it. They had a Riley Blake charm pack that was really in my style. I love the Riley Blake collection. So cheerful and colorful! I love the new Sweetwater collection, Reunion! Thanks for the giveaway. I I'll check out the store. Pear Tree is my fave...the little birds are so cute! Went to their site. Those Hoot Owls are sooo cute and the Farm Fresh Root Cellar prints are great! My favorite collection is A Walk In The Woods by Aneela Hoey. I love the hoot owls on trees with the brown background. I love the Sugar Rush line! I love to bake, so it would be perfect for me! Fabric is always the best kind of giveaway. Thanks for hosting this, but especially for pointing us to a shop with such great prices! I'm really impressed! I am really liking the Fly a Kite line right now. Wow. I like the Kitchy Kitchen collection by Blend Fabrics. I've never seen these. They're so bright and funky. Love them! Always love to shop online for great fabric. Thanks for letting us know!! Thanks for the giveaway! Who wouldn't love some free fabric! Fly a Kite by Riley Blake..... so cute! I LOVE the Hoot Owls line. Darling! There are so many nice fabrics, but, I think "elephants on parade" by Timeless Treasures is really cute. Thanks for the giveaway. This is a great place to find fabrics, thanks for sharing. I visited Fashionable Fabrics' sight and I loved the Alphabet Soup line! Love your blog....check in almost every day. That for introducing us to another fabric store...tis great. Thanks for a chance for a giveaway. Thanks for the chance to win! So many great fabrics in this shop. Ooh, just fell in love with the Lil Miss Sew & Sew by Dan Morris. Rocket Scientist Planets in green flannel is almost as awesome. My favourite fabric would be Little Apples Little Apple Tree Aqua by Aneela Hoey, I love all the colours inthe range. This is a new website to me. Thanks for the giveaway. I always like visiting your blog. Thanks for the new store link, and thanks for the chance! Right now, my favorite is Fly a Kite, but a love Reunion by Sweetwater, too! I love Fashionable Fabrics!! thanks for the chance. Sis Boom by Jennifer Paganelli is awesome! Thanks for the chance to win this lovely giveaway!! Thanks for the information on a new source of fabric. I'm heading over to check it out now. I think I need to get Delighted by Riley Blake. Great shop. Thanks for the new source for fabric!! Can't wait to see what new loveliness they have! I am loving Aviary 2 by Joel Dewberry! There is always a need for unique prints. Wow! Thank you for a great giveaway! I have ordered from this site before, it's great value for money especially as I live in New Zealand. I am in love with the new Lush rang from Patty Young. I've browsed through their site previously and I love their selection! Just went visiting to the site and saw Fly a Kite. Love it! Thanks for the chance to enter! I love the Amy butler fabric! Love your mystery block! I'd just love to win too, we are all winners because we quilt, right?! Thanks for the lovely giveaway, I already "like" Fashionable Fabrics on FB. That's so difficult to pick just one favourite, I like Dress up on Grey, and Dressmaker Patchwork and Perk Me Up...I would like to make bags out of these. I love the Heirloom Blockade Blossom by Joel Dewberry. Sugar rush would be a cute print for a tea holder for my purse. Wow, thanks for showing us the new store! I looked around the store, and I really like it that you can browse the fabrics not only by designer or manufacturer, but by Prints! I did that, and in the vintage sectoin I fell in love with the Dressmaker series, by Red Rooster, and the print, Home Sewing Patterns, by Blend Fabrics. Yummy! Lovely store. full of goodies.Thanks for sharing. I looked around and one of my favorites is Sugar and Spice by Riley blake. I love Walk in the Woods. Thanks for the chance to win! Great shop--thanks for sharing it with us! Gorgeous fabrics. Thanks for the chance. Well - it's got to be anything by Robert Kaufman hasn't it. Simply the best! I love this print Elephant Showers on Navy by Timeless Treasures... I can see and new bag in this design!!! Thanks for hosting the great giveaway!!! Thanks for the chance and yes I did visit the blog and I like Sugar& Spice by Riley Blake. fabric.....fabric......fabric...... can't get enough! Thanks so much! Hi - I'm a follower and am excited about this giveaway! Fashionable Fabrics has an awesome selection!